For today, I have something special for you. Who of you has heard of Bitcoin? Probably everyone. But I am sure, most of you don’t know, how you can buy a bitcoin or what you need to buy one. The whole topic of Bitcoin is a really complicated one, but to get started with cryptocurrencies, it’s enough, to know the basics. To help you out with this, I made this “How to”. 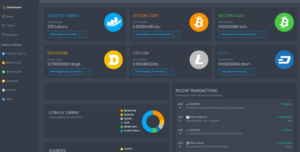 Step by step I am going to explain you, how you can easily claim some coins without investing real money at the Coinpot faucets. Also the amount of time you need each day is really low. 3 minutes daily are enough to get you started. Sure, if you invest more time, you can earn more. But with just the 3 minutes daily, you can earn around 2-3 Euro each month. But to get started with cryptocurrencies and Bitcoin, it is more than enough. With this faucets here you get Satoshis most of the time. 1 Bitcoin equals 100 million satoshis. At first, we need a Bitcoin-Wallet for the coinpot faucets. Please keep in mind, that there are a lot of different wallets out there. The safest ones are offline-wallets, because you are the only one with access to it. But it is more than enough to use an online-wallet to start with faucets and to test cryptocurrenies. But don’t keep too much money at your wallet. It works a bit like online banking and they won’t scam you, but better be safe than sorry. For our first wallet, I recommend Coinbase. After this, we have to create a microwallet. It’s like a moneybox. Every day, you collect your coins here. As soon as you have enough, you bring them to the bank. For this, we use coinpot.co. Here we click on register. It is VERY important, that you use a valid email-adress. This email-adress is VERY VERY important. 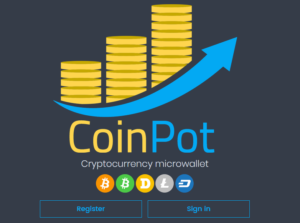 With it, you can access your microwallet, you also need it to collect coins from the Coinpot faucets. They send your coins directly to your microwallet, if you use the same mailadress at each site. Here you see a overview of your different coins and so called “tokens”. Every time, you get coins from a coinpot faucet (you call that “claim your tokens”) you get 3 tokens from Coinpot. 100 tokens are currently worth around 144 satoshis. It’s a nice addition to your coins, you get them without doing anything at all. Now your microwallet is ready. Currently, there are 6 faucets, which are linked directly to coinpot. At all of them, it is enough to solve a captcha und press on claim. Then you get your coins directly sent to coinpot. 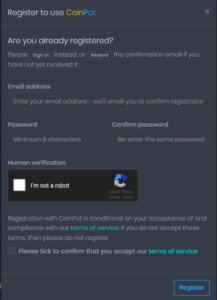 It is really important, to use the SAME mail-adress here as you used for coinpot. If not, you don’t get your coins sent there! That’s the same for EVERY coinpot faucets, use the same mail-adress for all of them. It’s enough, if you claim once a day. The longer you don’t claim, the more coins you get as soon as you claim them. But if you claim at least ONCE a day, you get 1 % more coins for each day, this is a called a loyalitybonus. There is also an offerwall and some games, but they are not great, I recommend you just ignore them. If you claim more than once a day, you also get more coins. The reason for this is, it takes longer to create more coins for you, the longer you were away. For example, if you claim an hour later, you get 10 satoshis. But if you claim 2 hours later, you just get 19 satoshis. Therefore it is better to claim as often as you can, you also get 3 tokens every time you claim. The next 5 faucets all look very much alike, that’s why I list them together. The last coinpot faucet is a bit different, you can find it here. You can claim once every 15 minutes and get a few Satoshis right to your coinpot wallet. Also, you get 5 % bonus from all claims for the last 72 hours. That means, if you claimed 100 Satoshis in the last 72 hours, you get 5 Satoshis extra to your wallet. So, if you followed all steps, all you need to do is visit each coinpot faucet once a day and claim your coins. If you have any questions, just send me a mail! Now all you have to do is, collect some coins! After you got some coins, you can transfer them to your wallet. I tell you more about this in a few days. Then I show you how you create a wallet, transfer your coins there and change them to Euro. Hi Coinpot is great option to make some money fast. I recommend it too.